I should have known from the screenshots and very sparse offering of information that something wasn't right with Reef Entertainment's upcoming Rambo: The Video Game. Well, the Spider-sense wasn't too off, as new information reveals that Rambo is an on-rails shooter with a “fixed perspective”. Bummer. To offset the news that this game may or may not be a good rail-shooter such as old arcade titles like Time Crisis or Operation Wolf, Reef released a new screenshot, which you can view below, courtesy of VG 24/7. Shoot-Out: All-out action in fixed-perspective shoot-outs – players will need to make tactical use of cover-options to survive the enemy onslaught. Mini-missions, multiple-paths, quick-time-events, interactive scenery and more than 25 enemy types will keep player’s adrenaline-pumping. Destruction: Unleash heavy weapons such as the M60, explosive-tipped arrows and time-bombs. Cause some wide-spread damage against hard-targets. Take control in iconic scenes from the films such as Rambo’s destruction of the Police Station in First Blood. QTE-Fight: Authentic fight scenes from the movies are recreated in third-person, quick-time-events sequences. Stealth-Hunt: Fixed-perspective infiltrations through forests and enemy-camps armed with Rambo’s trademark Bow and Knife. Dodge search-lights and time your bow attacks perfectly to silently eliminate enemies from the shadows. Knife sections will give players the choice of lethal or non-lethal force. Bosses: Boss showdowns and take-downs from the films – everything from Rambo’s single, explosive bow strike on Lieutenant Tay to shredding Russian helicopters with the DShK 12.7mm Heavy Machine Gun. I don't know what to think of this game...I honestly don't. I mean, let's be honest here: rail-shooters this gen have not been good. A lot of first-person shooters are almost practically rail-shooters (i.e., Call of Duty) and they seem to play themselves with very little skill required. I don't know how Rambo: The Video Game will fit into the market with what sounds like interactive movie sequences with light play-controls afforded to the player. Nevertheless, it's Rambo. He fathered the term “this game lets you go all Rambo on the bad guys” and he's the reason it's cool to get all shiny and oiled up and then tie-tight a bandanna on your head with a Jheri curl. Also, Rambo single-handedly made it awesome to shoot explosive-tipped arrows from a compound military grade bow. 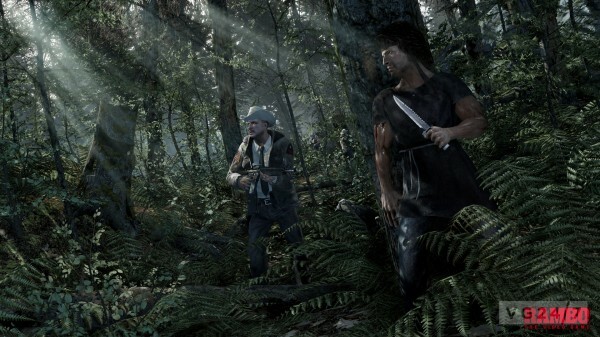 Tomb Raider and Crysis 3 have Rambo to thank for their Cabela-style hunting gimmicks. Still, I'm torn on this game. If Rambo: The Video Game is at least a really good, fun on-rail shooter then that's cool. But if it's a terrible cash-in style shooter...well...then that's terrible.